SCRAPiVERSE: On Shopping: New Tim Holtz Stamps and Other Fun-ness. 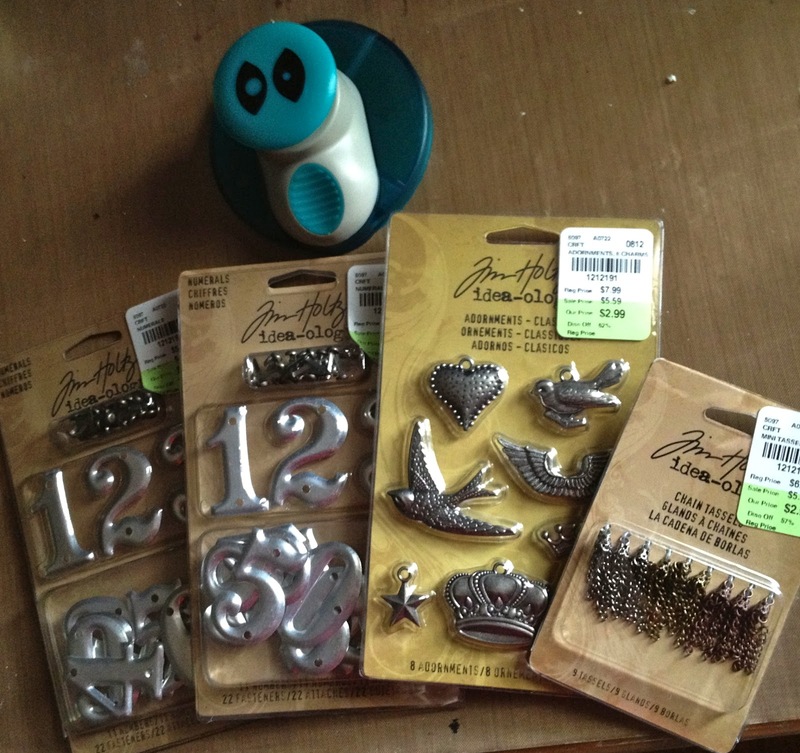 On Shopping: New Tim Holtz Stamps and Other Fun-ness. I'd planned to share my shopping spree recap with you, on my previous post about making the treasure boxes. But I forgot ALL about it by the end of the post and wandered off to try to take a nap. Luckily, the sharp eyes of Bella caught it- and, so- I'm back! Week after week, there's a moment during the mid-morning on Fridays when a voice of reason and clarity tries to speak loudly amongst the crazy voices in my head. "Don't buy more supplies! Why don't you use what you have?!" Then, one of my favorite stores (My Heart's Fancy) will post that they have new products. Well, screw that saving money and living like a monk thang! I work hard and I'm not serving any prison sentences- so why shouldn't I have all the fun I want?! The 'shopping weekend' began at my lunch hour on Friday. With Holly Busch. We went to Basket Market- where, EXCITEMENT- we ran into Tanya, of Creative Endeavors. Do you know Miss Tanya? She's beautiful, fun, funny, and TALENTED! Lady can Silhouette! I didn't find anything earth shattering cool, this time, at Basket Market. It wasn't the Studio Calico jackpot that it was a couple of weeks ago. But I did score some great (name brand, too!) 6X6 paper pads and some very nifty American Crafts metallic pens. As soon as I was able to drag myself out of the house, this morning, I staggered up to 165th and Penn, to check out the new stuff at My Heart's Fancy. 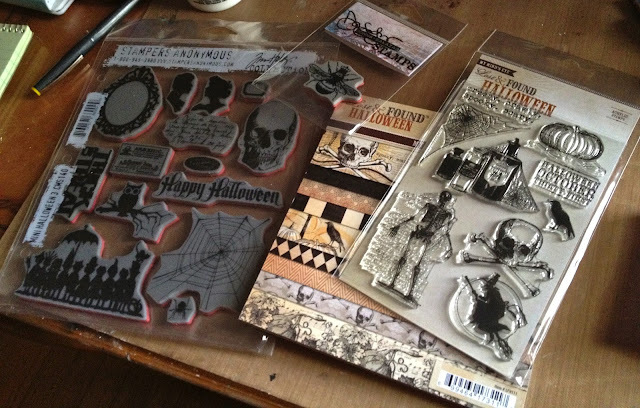 I got some of the new Tim Holtz Halloween stamps as well as the My Mind's Eye Halloween stamps. I also got their 6X6 Halloween paper pad. It looks great! Aren't they great?! I also bought that little bee stamp. Why? No idea. I *really* wanted the other Tim Holtz stamps, too- especially the cemetery headstone blueprint one- but for some reason, decided to show some restraint. I *am* going to CK/Tulsa next weekend. After leaving My Heart's Fancy, I decided to stop in at Tuesday Morning. Imagine that- a little score! I found these Tim Holtz ideology thingies- for 2.99 each! And that corner rounder with a hole punch thing, too. I LOVE these metal numbers. I know I should've bought one more package of them... The tassels, I don't know what I'll ever use those for... but, just in case: 2.99. Now, I'm really, for real, super seriously gonna try for that nap. I need it. Especially if I'm going to stay up all night again! Also, this is my last period of 'free time' for what could be a long while. I start rehearsals for the next show I'm working on- as well as production managing the show following it- it's gonna be work work and work for ... well, until the theatre season ends! you should've posted a disclaimer...now I'm on the search to find a Tuesday Morning while on vacation! great finds!